Materials: Recycled, Reclaimed Linen Blend Fabric, Deka Textile Paint Surface Design, Linen, 90/10 Feather Down Pillow Inserts. Visual, 9.75” x 18.5” approx. 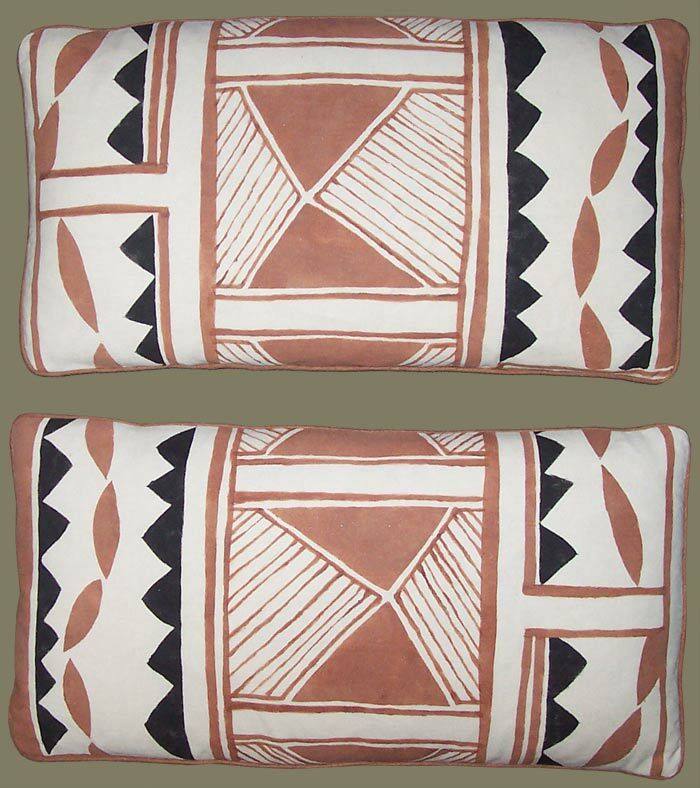 Description: A Pair of Artisanaware Lumbar Pillows With a Hand Printed Surface Design Inspired by the Designs of Southwest Anasazi Pottery. Stencil Printed and Hand Painted in Black and Cinnamon on Recycled, Off White Linen Blend Fabric. Mini Bias Welt Detailing in Cinnamon Colored Linen. A One of a Kind Pair of Ethnic Inspired Designer Pillows with High End Feather Down Pillow Inserts and Hand Stitched Closures. See Companion, Anasazi Motif Pillow. These Southwest Motif , Lumbar Pillows Would Work Well In an Adobe Interior, Surrounded by Collections of American Indian Artifacts and Rugs. A Carol Tate Design from the Artisanaworks Workroom/Studio, Texas Hill Country, USA.